It was once known as the Peruvian Apple, in France it was named the love apple, and in Italy it was known as pomodoro-the golden apple. Our name, tomato, comes from the ancient Nahuatl name tomatl. Wild forms of the tomato originated in South America in areas of the Andes Mountains, and were brought to Central America and Mexico by prehistoric Indians. They were introduced to Europe in the 16th century, supposedly by Columbus, although at the time tomatoes were grown for ornamental purposes and were considered poisonous. The tomato plant was brought to North America in the early 18th century, but was not accepted as a food plant for another 100 years.The fruit began to gain popularity in America with the growth of the Campbell Soup Company after its commercial canning factory opened in 1869. It is now the third most popular commercial vegetable and the single most popular home garden vegetable in the U.S. Interestingly, the tomato did not appear in Chinese cooking until the last quarter century. Although botanists classify tomatoes as fruit, the U. S. Supreme Court ruled to apply vegetable tariffs on them in 1893. By the early 1900s, the USDA began breeding tomato cultivars to develop specific characteristics such as disease and pest resistance, cold and heat tolerances, salt and drought tolerances, and uniform ripening. Unfortunately, by the 1950s, the hybrids coming on the market were being bred for shipping date and not for taste. Lucky for us though, there are so many varieties now being produced we can find tomatoes that grow in just about any climate or condition- even the arid desert! 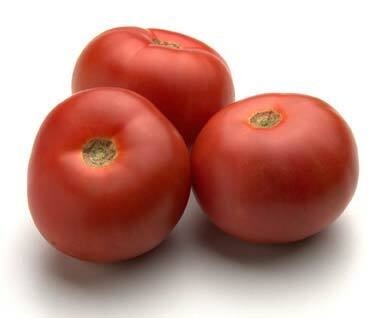 Tomatoes are members of the nightshade family, Solanaceae , which means their leaves are toxic and should not be eaten. They are a warm-season perennial plant, usually grown as annuals. We have two short growing seasons here in the desert: March through June, and again from September through November. Most plants yield an average of 10 to 15 pounds of fruit. Tomato plants are classified as either determinate or indeterminate types. Determinate plants are usually bush types that mature to a size of 3 to 5 feet, set fruit, and then decline. Although most have early-maturing fruit, determinate plants do not produce for extended periods. 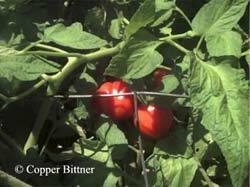 Indeterminate types are generally vining plants that grow until frost or disease kills them. They require some support to keep the fruit from sitting in damp soil, and they produce larger crops over a longer period. With the right conditions and care, these plants can produce fruit for two or three seasons before they lose vigor and production decreases. Tomatoes range in size, color, and shape-from bite-sized cherries to the 2-pound Bigboy. Colors include pink, yellow, orange, purple, striped, and even black. Depending on the variety, they can be rounded, oblong, or pear-shaped. When considering choices of cultivars for our climate and growing seasons, consider earliness or maturity (how soon the fruit can be harvested after planting out), adaptation to our climate and soil conditions, and also disease and pest resistance . Remember, we are not looking for large tomatoes here, but quality tomatoes. Larger types of tomatoes require more time for ripening, so it's best to plant the small and medium-sized varieties in our desert gardens. 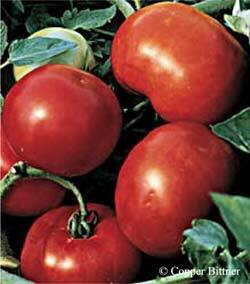 Look for tomatoes labeled for 60- to 70-day maturity. Successful varieties include: Yellow Pear, Cherry, Sweet 100, Earlypak, Earlygirl, Small Fry, Patio, Champion, Earliana, and Sunripe. When looking for resistant varieties, the letters "VNFT" indicate a plant's resistance to Verticillium Wilt (V), Nematodes (N), Fusarium Wilt (F), and Tobacco Mosaic Virus (F). January is the month to start thinking about planting your tomatoes. Since transplants can be set out as early as February 15, now is the time to decide whether you will start with seed or container plants from the nursery. The time required to germinate seeds and grow seedlings large enough for transplanting ranges between 6 and 8 weeks. Nursery transplants require less work and time on your part, but seeds provide a much larger selection of tomato types. When starting from seed, select containers with good drainage. Peat pots work great because they can be planted directly in the ground after scoring their sides. Fill the containers with a light to medium soil mix, and then add enough water to settle the soil until water drains from the bottom of your containers. Use your finger to indent the soil to a depth of 1/4 to 1/2 inch. Place 2 or 3 seeds in each hole and lightly spread soil over the seeds without tamping. Sprinkle with a little more water, just enough to ensure good seed contact with the soil. Placing clear plastic containers over the top of the pots creates a mini greenhouse, but this is not necessary if you have a warm, sunny windowsill where you can remember to monitor soil moisture. The containers should receive at least 6 hours of good sunlight daily. It is important to keep the soil moist, but not soggy, through the germination period. Usually a few sprays with a misting bottle 3 or 4 times a day is sufficient, but never let the top 1/2 inch of soil dry out. Germination usually occurs within 10 days. A week after the first true leaves break through the soil, thin each container to one plant by gently pulling the weaker seedlings at the soil line. Change the method of watering to a deeper, less frequent, application remembering that the soil should remain on the moist side, but should not stay soggy. Turn the plants occasionally to allow them to receive even sunlight all around. Once your plants are about 2 inches tall, you can begin to fertilize by adding a diluted fertilizer when watering. One teaspoon to a half-gallon of water is recommended. In about 6 weeks, your plants should be 4 to 6 inches tall and ready to be planted out if temperatures allow. Before planting however, it is best to harden off the plants for a few days by setting the containers outside in a well protected area. They should be protected from too much wind or sun, and if the nights are expected to drop below 60 degrees, you should bring the plants inside again until morning. Optimal conditions for planting tomatoes in the desert garden include the right location, p roper soil preparation, and favorable temperatures. Sunlight is essential to tomatoes, so locate your garden in an area that receives a minimum of 6 hours daily, preferably morning sun. The east side of your home or other large structure is ideal. Otherwise, consider planting your garden in an area where larger growing plants (sunflowers, corn, etc.) can be utilized to shade your tomatoes during the hottest part of the day. Building a frame on which to attach shade cloth is another excellent way to protect your fruit once the weather starts getting hot. Prepare your site early by tilling soil to a depth of 2 to 3 feet. Incorporate composted manure, ammonium phosphate and soil sulfur into the planting area. Remember that feeder roots of tomato plants range from 2 to 4 feet, so be sure to mix the backfill and amendments thoroughly and deeply. Water the planting area, then wait two weeks and water again. Wait at least one more week before planting so the soil is not too wet. Once the soil is ready, your new plants have hardened off, and soil temperatures have reached 60 degrees, it's finally time to plant! When planting in the cooler months of February and early March, consider planting young transplants on their sides in 2- to 3- inch trenches where the soil is warmest. Remove all but the top 2 to 4 sets of leaves from each plant, lay plants in individual trenches about 24 inches apart, and bury all but the leafy part of the plants. The stalks will produce new roots and give new plants a better start. New vegetative growth will reach upward toward the sun within a few days. Tomatoes should be bottom-watered (water the roots, not the leaves). Soil-borne diseases can cause problems if water splashes up from the soil to the leaves. Soil should remain moist, drying slightly between waterings, but it should never be allowed to dry completely, nor should it remain too soggy. Water deeply (2 to 3 feet) once a week during the cooler weather and increase watering to 2 or 3 times a week in the summer. Mulch heavily with organic material to help maintain and moderate soil moisture. Watering is most critical when plants are producing flowers and fruit. Fertilize plants with diluted fertilizer every 2 or 3 weeks until flower and fruit production begins. No additional fertilizer should be re q u i red until plants have completed fruit production. Avoid late and excessive applications of nitrogen. Too much nitrogen stimulates unnecessary vegetative growth and delays the fruit from ripening. Keep the surrounding area weed-free. To aide in flower pollination, shake plants lightly each day after flowers appear. Generally, it is said that flowers do not set fruit when temperatures are below 55°F or above 90°F. However, I have had abundant tomato production all summer long when growing smaller varieties, cherries and yellow pears, in heavily mulched soil under 50% shade cloth. Indeterminate plants that have stopped or slowed production in the hot summer temperatures will often become productive again when the weather cools in September and October, so don't give up on them when they look half-dead in August! A common pest is the tomato hornworm. You may also see tomato fruit worms (also known as corn ear worms), cutworms, flea beetles, spider mites, and aphids. Microscopic root-knot nematodes can enter the root tissues, affecting the transport of water and nutrients. Caterpillars (worms) can be handpicked and disposed of, or the leaves of plants can be sprayed with Bacillus thuringiensis (Bt), a product that only affects caterpillars. Many other pests can be controlled with insecticidal soap spray. Root-knot nematodes can usually be prevented by proper crop rotation, or solarizing the garden bed using a clear plastic cover in the summer months to kill pathogens located in the top 12" of the soil. Common diseases include Fusarium Wilt, Verticillium Wilt, Curly Top, and blights. To prevent Fusarium and Verticillium wilts, select resistant varieties. Use floating row covers or shade cloth to prevent leafhoppers from spreading Curly Top and other viruses from host plants. Other problems include sunscald, leaf roll, wilting, cracks in fruit, and blossom- end rot. These are usually related to our heat and are worsened by poor watering practices. Using a 50% shade cloth and correcting the method of watering should solve these problems. Blossom-end rot is believed to be due to a calcium deficiency that may be the result of irregular watering even though there may be an abundance of available calcium in the soil. Wait for fruit to ripen on the vine whenever you can. For red fruit types, wait until a deep red uniform color is achieved. For the best flavor, pick just before use. Cut fruits from the plant; do not pull them off. If picked while green, tomatoes can be ripened in a paper bag containing a banana or apple. Tomatoes can be dried, canned, or frozen. The best tomatoes for drying are paste tomatoes, such as Romas. Juicier, less meaty, tomatoes can also be dried; they just take a little longer. Although we can dry tomatoes outside in the sun since our summers are so hot, I prefer a food dehydrator because it's quicker and I don't have to worry about insects. The fruit can also be dried in a warm oven at about 150 degrees for 10 to 15 hours. (Actual time depends on the thickness and variety of the tomato). When fully dried, no pulp should be sticky or tacky to the touch. Store dried tomatoes in airtight containers in a cool, dark, dry place or pack them with olive oil in a sterilized jar. You can add herbs or garlic cloves at your option. Ripe tomatoes can be frozen whole. Place them in a plastic bag, pushing out excess air from bag, and seal tightly. When thawing frozen tomatoes, place them in water (at room temperature) and the peels will come off easily. You can also freeze tomato sauce, salsa, or puree in airtight plastic bags or containers. While many people find that freezing is easiest, canned tomatoes taste better. The process uses heat to pack tomatoes or sauces in high-vacuum jars as it removes oxygen, destroys enzymes, and prevents the growth of bacteria. Flavor stays in and microorganisms stay out. Canning involves much more work, but it's worth it. Tomatoes are considered one of the best health foods in the American diet. They are packed with vitamins and minerals. One cup of cherry tomatoes contains approximately 31 calories, 7 carbohydrates, and only 0.5 grams of fat. Desert Gardening: Fruits and Vegetables, The Complete Guide. Cromell, Guy, & Bradley. 1999. McMahon, Kofranek, & Rubatzky. 2002. Hartmann's Plant Science. 3rd Ed. Extreme Gardening, How to Grow Organic in the Hostile Deserts.